Delhi Cooks Biggest GM-free Baingan ka Bharta at Dilli Haat! File photo of protest against Bt-Brinjal in: The Anti-GM wave has touched all parts of the country. The controversial Biotechnology Regulatory Authority of India (BRAI) bill which has been tabled in the Monsoon session of the Parliament is facing much resistance from civil society across India. According to Greenpeace India, the Bill will end the right to safe food by promoting (rather than regulating) the introduction of Genetically Engineered (GE) crops in the country. 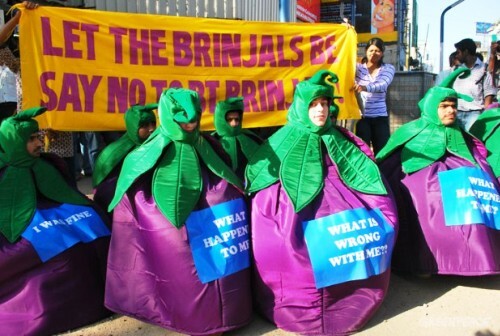 The debate in India on GE crops had started with Bt cotton, the only commercially approved (non-edible at least by humans) GE crop in the country (since March, 2002) and now revolves around the approval of Bt Brinjal, which could be the first GE food crop in India. According to analysis by the Greenpeace India, the BRAI Bill explicitly clarifies in its introduction that it is for promoting the safe use of modern biotechnology and to set up a regulatory body for that. Given the strong body of evidence of health, environmental and socio-economic impacts of genetically modified (GM) crops, there should actually be a regulation to ensure biosafety than to promote the use of modern biotechnology. The BRAI is hosted by the Ministry of Science & Technology (S&T) where the Department of Biotechnology, under the Ministry of S&T has the mandate to promote GM crops. Further, according to Greenpeace India, many members of the Review Committee for Genetic Manipulation are GM crop developers. In order to highlight these issues revolving around the promotion of GM crops and the BRAI Bill, Greenpeace India was joined by hundreds of Delhiites from all walks of life at Dilli Haat yesterday to witness the making of the world’s biggest GM free baingan ka bharta. A team of chefs from Le Meridien, New Delhi and Indian Culinary Forum lad the cooking of about 342.5 kg of baingan ka bharta, which was then certified as a record by the Limca Book of Records. A portion of the bharta along with more than 100,000 petitions were handed over to the Prime Minister’s Office (PME) by a delegation of citizens. The bharta at Dilli Haat was part of a public campaign which saw more than a hundred thousand citizens across India signing a petition against the upcoming Biotechnology Regulatory Authority of India [BRAI] Bill, 2011. The BRAI Bill is feared to become an easy single window clearance system for GM crops in the country. The gathering urged the government not to table the proposed BRAI bill but to come up with a biosafety protection legislation that will protect and enhance biosafety and ensure democratic processes are adhered to when dealing with issues as important as food and farming in our country. If the BRAI is passed as an act in the parliament, Bt Brinjal will be back, and following it is GM Maize, Bt rice , Bt tomato, GE mustard and 40 other food crops. The aroma of what cooked at Dilli Haat would have surely reached the decision makers and the corridors of power in the city. We hope better sense will prevail and the right to choose our food will continue to remain a basic right that it has been since the dawn of civilization. Hi there to every body, it’s my first pay a visit of this webpage; this weblog consists of remarkable and actually good stuff designed for readers.